"Explains the transmission of image and video information over wireless channels. Describes MPEG-4, the latest video coding standard. 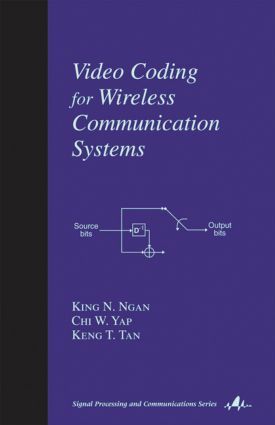 Discusses error resilient combined source channel image and video coders, and multiple access spread spectrum and future generation wireless video communication systems." "…epitomizes almost all-essential technical information …"
Source coding; MPEG-4 standard for multimedia applications; channel coding; radio channel modelling; error resilient combined source channel modelling; error resilient combined channel video coder; multiple access in spread spectrum communications; future generations wireless video communications; future generation wireless vidoe communication systems. Appendices: An introduction to Galois Fields; coding tables for the H.263 standard.